September | 2015 | Really??! September 2015 – Really??! I was recently chatting with a friend about how tough it can be as a parent to watch our kids go through the same struggles we did at their age. To my surprise, though, I’m more patient with my kids than I’ve ever been with myself. Now that I have one teenager and one “tween” (okay, I know that’s really a term for marketing people who are trying to sell stuff to 10-year-olds, but you get what I mean), I do my best to explain, as I say in my personally coined phrase, “everyone’s got something.” (Yup, you can use that!). I remember being about 15 years old, and going to bed what I always assumed was way earlier than any other human my age. Anyone who has known me for more than a few days knows that it’s still the case. It’s a rare night that I’m up later than about 10:00. I know I don’t function well without enough sleep, and I’m okay with that. But at 15, I know it was something that made me feel different and weird. Thinking that everyone else was staying up later, and I was some freak who required a full eight hours of sleep. Fast-forward just a few years when I was in college. I still needed a good night’s sleep. And while I wasn’t quite ready to embrace it, I could speak up about it. I could go next door in my dorm and ask the girls to turn down their music. I could go home after an afternoon and evening of bar-hopping, while friends would stay out for another bar and hours longer. Shortly after I joined a sorority, we went on a weekend trip to another campus. Most of the girls wanted to stay out late. I was thankful to find two like-minded people who wanted to head back and get some sleep; they ended up being some of my closest friends during my college years. I tell my kids these stories, with the hopes that they’ll understand that the things that make them feel different, alone and weird now are the very things that I someday hope they can learn to love about themselves because these are the things that make them who they are. And that everyone, no matter how self-assured and cool they seem to be, has something they also feel different and weird about. Some kids, like me, need a lot of sleep. Some kids are anxious or depressed. Some kids have physical limitations. Some kids are adopted, have two moms, or are coming to realize that they’re gay. Some kids struggle in school. Some struggle to make friends. The point is that everyone’s got something. Nobody is perfect, in the sense that none of us are without something that makes us feel different or alone. But on the flip side, we are all perfect, because these are things that make us unique and who we are. Let’s help our kids understand that, and to embrace their differences and the differences of others. We will always be grateful for your knowledge and surgical skills, and for fixing our son’s torn ACL. We understand that there are few cases like his, because not too many 9-year-olds are unfortunate enough to tear their ACL. We understand that you see a lot of patients for a lot of different things. In fact, we understand a lot more than you think we do. And after a frustrating and upsetting visit to your office today, we think there are a few things that YOU should understand. 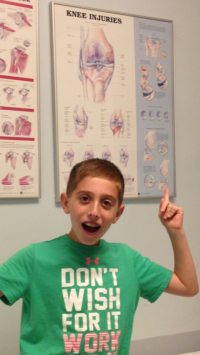 Our son is not just another case for you to add to your study. He is a kid who has now spent about 10 percent of his life dealing with a knee injury that’s usually reserved for professional athletes and grownups. If you’re going to change your tune and tell us 10 months after a surgery you’ve been telling us all along would take a 9-12 month recovery (and now it might be as long as 18 months), you ought to have some reasons for that. Obviously, we want to keep our kid from re-injuring himself, but it’s our job as parents to manage his expectations. And it’s tough to do that when the expectations change and we’re not notified. And while I get that you’re really busy, it would make things a lot less frustrating for everyone if all the people who were involved in our son’s rehabilitation were on the same page. When someone tells us today that our son shouldn’t be jumping, when the physical therapist (who, by the way, we switched to at your urging) told him months ago that jumping would be safe, I think you might understand why we’d get annoyed. When you asked our son if he was listening to you today, I assure you that he was, but he was looking away so you wouldn’t see that he was trying not to cry. And I can also assure you that he’s listening to you all the other times you speak, even when you’re talking to us and assume he doesn’t understand you. He’s a kid, but he’s still in the room, he can hear you, and he knows what you’re saying. And by the way, when you come into the exam room and ask him the same question every time (“What’s your favorite subject in school?”), you’re not really getting to know him. It’s still Writing, like it’s been every time you’ve asked. Maybe you should make a note of it, and get to know him some other way. Because you don’t really know him at all. You don’t know that he was given an award for his positive attitude from the gym teacher last year, even though he wasn’t able to participate in gym for most of the school year. You don’t know that he was given another award at camp this summer, for being one of two kids out of hundreds who were acknowledged for embodying the positive spirit and attitude the camp encourages kids to have. And he won this award while spending the entire summer in a knee brace, not being able to participate in the sports he loves. You don’t know that he loves basketball, because you continue to assume that he only plays baseball, because that’s how he tore his ACL. He loves basketball so much that he went to as many practices and games for his team last year as he could, even though he was on crutches and couldn’t play. You don’t know that he’s been working for the last 10 months to get strong enough to play basketball this winter. You don’t know that he has more than one person in his life who has nicknamed him “Smiley,” because he smiles most of the time. Even during this past year. You don’t know that my son is one tough kid. The day after his ACL surgery, when it hurt too much just to move, he’d ask us to put the theme from “Rocky” on, and that would be enough to motivate him to do the bending exercises you told him he’d need to do to get stronger. You don’t know that sometimes he cries because frankly, this is just all too much for a 10-year old. You don’t know that he left your office today upset, but with more determination than ever to keep working hard. My son is more than his knee. I hope you’ll try to remember that. When my kids were younger, I remember asking someone how I would ever talk to them about 9/11. We live in a New Jersey town where lots of people commute to Manhattan; our community lost more than a dozen that day, and we were close enough to see the smoke that rose above Ground Zero. It was a terrifying, world-changing day. I couldn’t imagine telling my kids about this horrible day without frightening them. Here we are, 14 years later. Matthew, who was a newborn on that day in 2001, is now a high school freshman, and Michael is in 5th grade. They both know about 9/11. They’ve learned about it in school, and we’ve talked about it at home. I’ve realized as they’ve grown that because they didn’t share the collective fear that encompassed us on that day, they would never feel the same as those of us who lived through it. I’m grateful for that. Even though we were fortunate to have not lost people close to us on 9/11, we have friends with stories of their journeys out of lower Manhattan that day. I was on maternity leave from my job, and watched the events unfold on NBC. I recall yelling upstairs to Dave that “some idiot just flew a plane into the World Trade Center.” But when the second plane hit, we all knew it was something more than that. Our sense of security would never be the same. As the years have passed and the memories aren’t as fresh, my thoughts of the day are less frightening. But each year, I can still recall the crystal clear, blue September sky that morning. The reporters on TV, who were at an absolute loss for words as to how to explain what was going on. The air that day, which shifted from a crisp early autumn breeze, to a smell that I still can’t describe and have never smelled again, but that I’m sure was from all that was going on just 20 miles away. The sinking feeling in my stomach when I watched the first tower fall live on TV. The relief at realizing that all the people we knew could have been affected were safely away from danger. I also recall the first anniversary of 9/11, listening to the reading of the names of those who died that day, and crying, as I do each year. I’m still not sure why. And teaching my second semester of a college public speaking course on that first anniversary, suspending my lecture for the day and offering students the opportunity to come to the front of the class and talk about their own experiences of that day a year earlier. Some couldn’t do it. Others did and broke into tears. 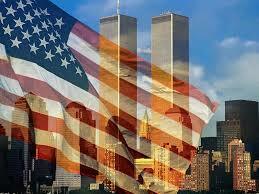 I realize now that on some level, 9/11 has become a bond that those of us who lived through it will always share. It seems that many people want to talk about how they experienced the day. I’m no different. I’d think that we’d want to forget the chaos and tragedy that was going on, but it seems that there’s some comfort in talking about what we were doing at each moment.